If you have a lawn, you know there are areas that your lawn mower just can’t reach. 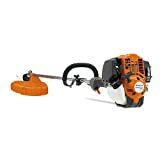 Finding the best weed eater (also known as grass weed wackers or string trimmers) for your unique situation is key to keeping your stress level down and your outdoor enjoyment up this summer. I know I have a hard time unwinding in my backyard if I see some bindweed or Canada thistle growing along my shoreline. I just want to eliminate the problem immediately – but without the right gas or electric trimmer that job becomes much harder. The trimmer is your main ally in the battle against grass and weeds that grow where your lawn mower fears to tread. Let’s help you make the right choice. We’ve come up with a list of top rated weed wackers for most usage situations. We’ll not only give you the facts, we also provide you with the reasons why a trimmer is a great fit for that type of yard and homeowner. Let’s get started! While you can find more in-depth information in the buying guide, the first decision you need to make before you can even begin looking for a new grass weed wacker is what power source it runs on. There are three power sources. Gasoline-powered eaters have a combustion engine to run the trimmer head. In the electric camp, there are corded and battery-powered. If you had asked me 5 years ago, I would have said battery-powered electric grass eaters were a toy. In today’s world, things have changed: in general a high-quality, high-voltage battery powered tool is as good as an average gas powered one. This table below quickly lays out the pluses and minuses of each category. Battery powered weed eaters are a favorite for their ease of use. To start, you just plug in a charged battery, press a button, and you are on your way. They are also generally lighter than gas-powered models. Another nice feature is the lack of emissions. No longer do you need to breathe in gas fumes while weed eating. While power used to be a big negative, newer, higher-voltage models rival 2-cycle gas powered trimmers. Finally, electric models are quieter than their gas counterparts. On the downside, battery-powered models have a limited run time versus either gas or corded electric models. In addition, not all battery-powered weed wackers can match the power of similarly-priced gas-powered ones. The newest, higher-volt models are making great strides in this direction however. Gas powered weed wackers are known for their power, and ability to cut through thicker weeds and growth. There’s a reason most professionals use gasoline. In addition, the lack of cords or limited battery power mean you can cover a larger area more efficiently with a gas-powered model. On the downside, gas powered trimmers are loud, give off fumes, and in general are heavier than either of the electric-powered types. They also require maintenance – both during the cutting season and to get ready to put the tool into storage. Neither electric-powered model types have that requirement. Corded-electric powered weed eaters are really easy to use. Plug in an extension cord, press the start button and begin cutting weeds. They are also generally lighter than gas-powered models. Another nice feature is the lack of emissions. No longer do you need to breathe in gas fumes while weed eating. Finally, electric models are usually the least expensive types of weed wackers. On the downside, corded electric models require you to have a long-enough extension cord to reach where you want to work. The cord can be heavy, which negates some of the weight benefit. It’s also sometimes a pain to keep an eye on the cord so you don’t cut it. Finally, they can be among the least powerful types of trimmers. 3-in-1 Capability with dual-position wheels for grass trimming, edging, and mowing. The battery and charger are packaged separately from the tool, but in the same box. The WORX 32-Volt GT2.0 is a solid choice for the average homeowner. The product is designed around convenience. You get a battery, a charger, and three spools of cutting line. Everything you need to get started is included. Once underway in your yard, the line feed is automatic. You won’t need to stop to “bump” the head to access more trimming line. The GT 2.0 will provide in automatically. It’s only a little bit over 6 pounds, and converts into a wheeled edger and mini-mower. Would I use this to cut my lawn regularly? No. But it does mean it can cut grass in tight areas your lawnmower can’t reach. This string trimmer is a beast. I generally think gasoline powered trimmers aren’t necessary for most landowners, but there are situations where you need one. For instance, if you own a few acres of land, gasoline power is really going to be the best choice for your needs. If this is your case – don’t mess around with 2-stroke engines. Just buy a 4. And this Husqvarna will fill those needs. It’s a 4-cycle engine, which means you get more power and don’t have to mess around with mixing the right amount of gas-to-oil in your tank. You still need to add oil, but it has it’s own storage “tank”. The 25cc engine will provide you with plenty of power. One trick you can use is to change the trimmer head to a metal one if you need to clear small brush. It won’t cut through redwoods, but it’ll cut through most anything you’ll encounter. This isn’t a cheap purchase, but a quality name like Husqvarna should last you for years and years to come. DEWALT is known for high-quality, professional grade tools. For most homeowners, this FLEXVOLT 60-Volt string grass trimmer will take care of all your tough-weed needs. 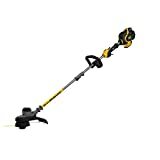 I feel comfortable saying this product delivers enough power to replace any 2-stroke gas engine trimmer that is older than 5 years. Why is this a solid gas-replacement? The battery holds enough juice to run for a long time, even at high-power. It seems most people don’t need the higher speed which can extend battery life by even more. If you purchase a 9AH battery, you can go for hours on this setting. One caveat – you likely will want to switch to 0.095″ line as soon as possible. The big compliant with this model is the line snaps often – that’s because the 0.08″ line that comes with it can’t handle the force dished out by the motor. 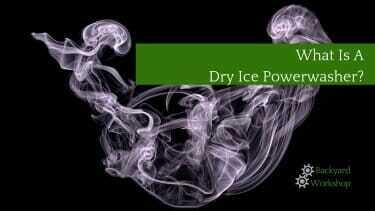 Here’s a link to one of the 0.095″ products that work. Ok, before I anger half the country – I own this model of battery powered string trimmer, and I’m a man. I do get asked quite a bit what model of weed wacker I’d recommend for someone’s mom or sister that does the yardwork. This is the model I usually go to – as long as they live in a normal urban or suburban neighborhood. This wouldn’t work well on a horse farm, for example. Both my wife and I like this tool. It’s push-button start. It’s maneuverable, has an adjustable shaft and handle, and isn’t very heavy at all. My guess is, all in (including the 1.5AH battery) it weighs in around 8 pounds. I don’t often use the lawn edger feature, but it is there when you need it and is pretty simple to use. It’s really quiet as well – you won’t need to worry about you or your loved one damaging their hearing when using this string trimmer. If you consider yourself to be on the taller side, you need to make sure your weed wacker has two features. First, you are looking for a straight shaft. This will allow you to benefit from the entire shaft length, rather than have some of it be “burned up” in the bend of a curved shaft. Second, you want a longer shaft. The good news is, most straight shafts by their very design are longer. Look for one in the 57″ to 60″+ range if you are over 6′ tall. Owners of this particular EGO model have commented it is as strong as some 2-cycle gas powered models they previously owned. I can’t say if that’s true, but the 56V power plan does provide a lot of power to get your job done. Unlike a gas model, you also don’t NEED hearing protection when using this model (though I’d still say you should wear it). As we said before, you need to look at your individual yard needs before you rush out and buy a string trimmer. Let’s go through the questions you need to ask yourself in order to pick out the right power tool for your situation. Do you have thick weeds? Can you handle a heavier, powerful weed eater? In addition, you need to decide for yourself just how much you want to spend. You don’t want to spend $300 on a top of the line weed eater if all you need is a cheaper battery powered one that will do the job. On the flip side, some yards need a commercial grade weed eater to get the job done in a reasonable amount of time. Like most things in life, there are trade offs between money and time. If you have a large yard,you really are limited to either a gas or battery-powered wacker. Your maximum reach will be about 150 feet from an outlet in ideal conditions – and you likely don’t have ideal conditions. A battery model could still work for you depending on how your answers to the remaining questions go. Do remember to keep in-mind the costs of additional battery backs when comparison shopping – a large yard will need at least 2.0 AH worth of energy to do the job right. Cost is always a factor. A gas powered weed wacker may be difficult to fit into a tight budget. They are generally the most expensive though you can find bargains if you shop around enough and are lucky. Corded electric tend to be the cheapest – the cost of batteries drives up the price of cordless models. Trimming down brush, or other thick areas will need a more powerful trimmer. Battery and corded weed eaters lack the essential power to take down larger weeds. Gas will be the only way to go on tougher jobs. All weed eaters are relatively easy to use. But gas powered ones will require a little extra work. You will need to mix fuel and change spark plugs from time to time during the summer. When the season is over, you must make sure to prepare the tool for storage – otherwise it’s likely you’ll have an expensive paperweight come the spring. Our ethanol-mixed gas plays havoc on gas-power tools if left untouched for 5-7 months. I speak from experience on this. If you aren’t very handy, or just want something simple with low maintenance, a battery powered, or corded weed eater is a good choice. If you live in an urban or other area where your neighbors houses are close to yours, you’ll want to take into account how loud your device is going to be. The actual trimmer head isn’t very loud at all – but a gasoline-powered mower can certainly wake up your neighbors even through closed windows. It might not be a primary concern, but if there’s no reason to tick off your neighbors with a loud tool, why do it? Some weed eaters will have a shaft that has a 90 degree bend at the trimming blade. Others will be straight. The ones with the bend will be easier to use and manage. The angle makes it the string hit exactly where you need it most of the time. However, the bend in the shaft does have some downsides with it. You won’t be able to get into hard to reach areas for one. It can be very difficult to get a good cut underneath bushes since the angle will stop the blade from going to deep. Trying to edge your walkway or patio with an angled shaft is also more difficult. 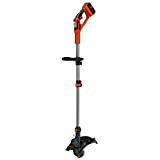 A straight shaft weed trimmer will a little trickier to use, but if you can get the hang of it, you can do more. They will reach tough spots and can easily be flipped to get a nice edge around or garden. It can be learned over time, but if you are having your children do the work be prepared for some “collateral damage” in the yard as they come up to speed. 1. Can fuel be left behind on the weed trimmer for a long period of time? It is not recommended that fuel will be left behind on the weed trimmers for a long period of time because there is always a big chance that gum deposits will start to form on the fuel system. If the fuel will be left behind for more than 30 days, this can cause the weed eater to nut run as stable as you would like it to run. 2. What type of gas can be used for the weed eater? There is a big chance that you would like to make use of your weed eater at the soonest possible time but you are not sure what gas you can use for your weed eater. Do remember that it will depend on the weed eater that you are going to purchase. Most weed eaters can run with unleaded gasoline. Some may also make use of alcohol based fuel but this is not recommended to be stored even for a short while. It would all have to be used up in order not to ruin the whole system of the weed eater. 3. Can the trimmer line break? There is still a possibility that the trimmer line may break probably because it has been exposed to an object that is too hard. Remember that when the trimmer head is too close to hard objects, it will break down. Make sure that you will not expose your trimmer line to bricks, stones and other hard objects so that you will not have this problem. 4. Can the trimmer line be changed if in case it gets broken? You have to remember that the trimmer line can be changed depending on the trimmer head that you have. It will be best to purchase a weed eater that will allow the trimmer line to be changed at the soonest possible time. Some trimmer lines can be changed by simply pulling out the trimmer line straight from the trimmer head. Another option is to unscrew the trimmer line that is in the area. 5. Is the spark plug needed in order to make the weed eater work? You have to remember that this would highly depend on the unit that you are going to purchase. It would highly depend on the weed eater that you are using. Read the manual in order to know the recommendations for the spark plug that you are going to use for your needs. 6. Will the weed trimmer have a fuel filter? There are a lot of weed trimmers that make use of fuel filter in order to allow the fuel that will be used to power the product become cleaner and better. Sometimes, the fuel filter would have to be used often depending on the type of fuel that you will use. 7. How will the fuel filter be removed? You have to remember that the fuel filter that you may have can highly depend on the fuel tank of the weed trimmer that you are going to purchase. If in case you would need to remove the filter, it will change depending on the type of weed filter that you may have. First and foremost, you would have to drain the fuel from the unit. Remember to remove it from the fuel line. If in case you would need to replace the fuel filter, you just need to do the things mentioned above and just drop in the new fuel filter. 8. Will the warranty of the weed trimmer be different? You have to remember that the warranty of the weed trimmer can change from one weed trimmer to another. There may be some weed trimmers that can last for about 2 years while there are also some that can last longer. You just have to choose the one that will work best for you. 9. Will trimming be easy to do? You have to remember that trimming will not be too hard to do. You just have to cut the string so that you can remove the string trimmers appropriately. Remember that as long as you know all the right cutting techniques, trimming with the use of your weed eater will be easier. Remember that trimming can also be easier if you are comfortable with the weed trimmer that you are using. 10. What are the reasons why the weed eater does not want to turn on? There are different reasons why the weed eater does not want to open. It may be because of the fuel that you have on your weed eater. It may have been left behind for more than 30 days. If you have left the fuel longer, you would have to change it entirely. Try the on and off switch button because you may have just gotten confused with turning it on and off. Another reason why your weed eater may not be turning on is because the fuel filter is already too dirty. If you have not cleaned your fuel filter for more than a year, you may have to clean this first and see if the weed trimmer is going to turn on after. The fact that your engine may be flooded is another possible reason why your weed eater has not turned on. Consider all of these reasons so that you will know what to do.